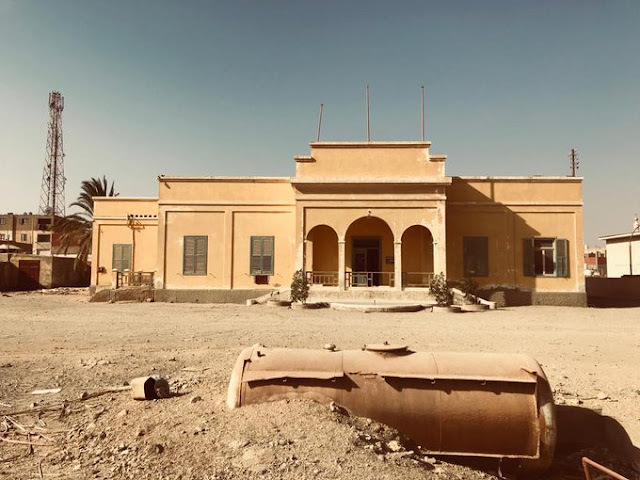 Egyptian Chronicles: Days at the Egyptian Museum of Cairo : Animal Mummies "Updated"
Days at the Egyptian Museum of Cairo : Animal Mummies "Updated"
Last Saturday, Egypt’s ministry of antiquities announced seven new tomb discoveries at Saqqara area. It is a huge announcement. Three of the tombs belong to the New Kingdom era while the rest four tombs belong to the Old Kingdom. Very beautiful artifacts were found at those tombs. 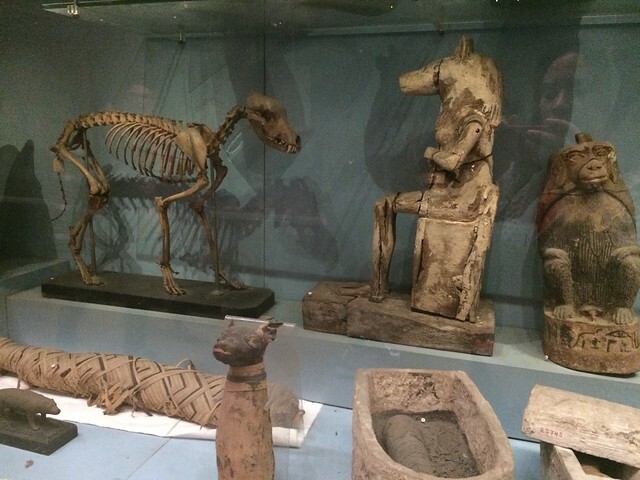 Now interestingly those three New Kingdom tombs were used at cat necropolis. The people are amazed by this fact but I am not surprised because in the end ancient Egyptians worshiped cats and they buried them in groups in tombs like those which were discovered in Saqqara. Now I seize this opportunity and share bunch photos I took in December 2015 and November 2018 from the animal's section at the Egyptian Museum of Cairo. 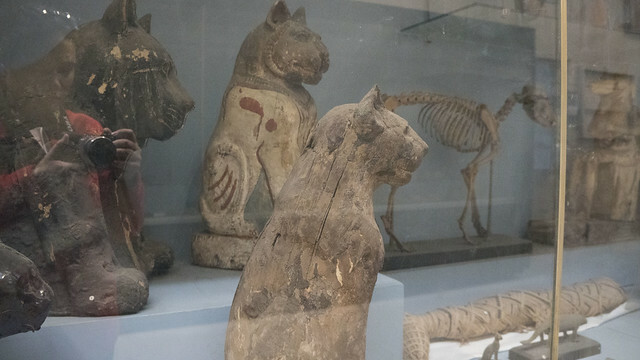 "Yes, this is moi at the reflective glass in November 2018"
There is a whole small section dedicated to animal mummies including cats as you can see at the Egyptian Museum of Cairo's second floor. 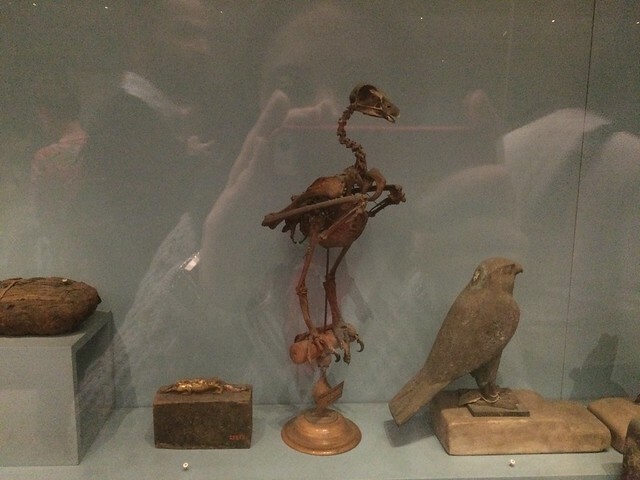 Different Animal mummies and skeletons at the Egyptian Museum of Cairo "December 2015"
There are mummies and skeletons of cats and other types of animals like monkeys and crocodiles in that small section. 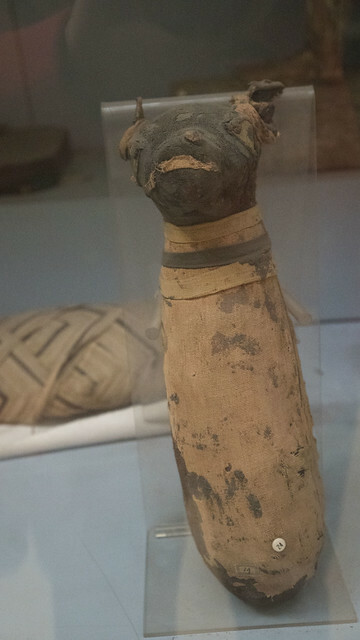 As a revered animal, cats are there mummified in wooden sarcophagi at the museum. 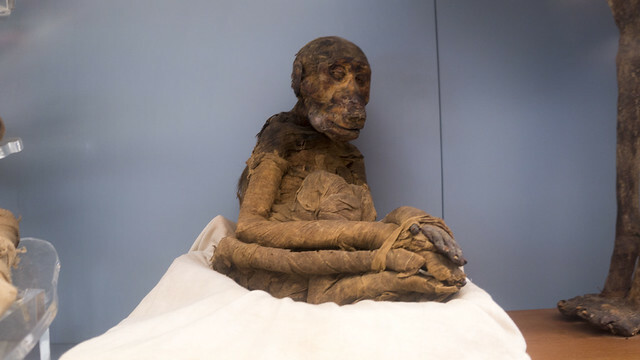 They are not scary like the mummified monkeys I must say. 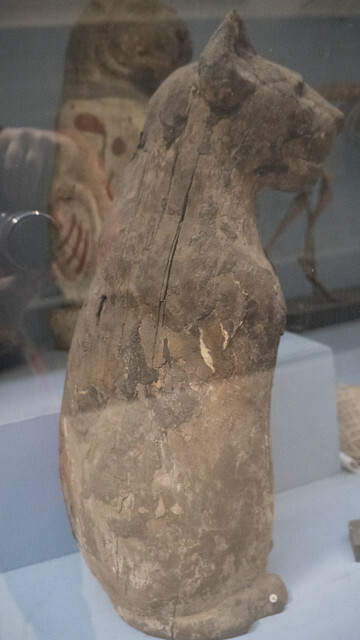 A mummified monkey at the Egyptian Museum of Cairo "November 2018"
There were lots of monkeys mummified in that section and needless to say in the dim lighting in November 2018 as the Museum is undergoing a revival and renovation process, it is a bit creepy. The monkeys especially baboons played an important role in ancient Egyptian mythology as one the death deities according to my knowledge was "Babi" , the Baboon which is depicted on over and over on the walls of ancient Egyptian tombs like King Tut's tomb at the Valley of the Kings in Luxor as well Hapi ,the son of Horus. 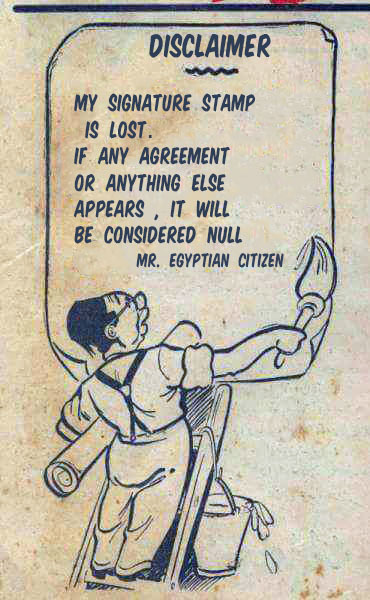 Needless to say, one look to the Egyptian mythology and the Egyptian Museum of Cairo you can know that monkeys especially baboons lived in the valley of the Nile for some time but of course not anymore. 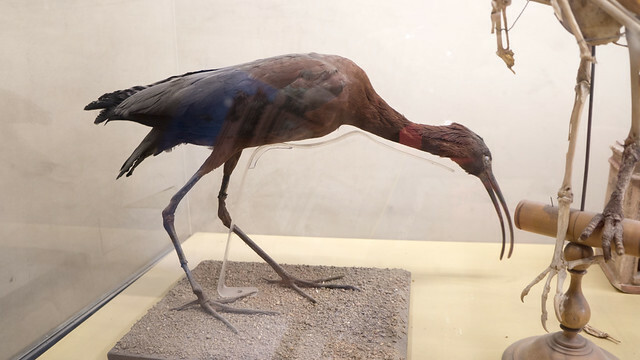 I think that there are animals exhibited in that section inaugurated during the rule of Hosni Mubarak that extinct from Egypt. 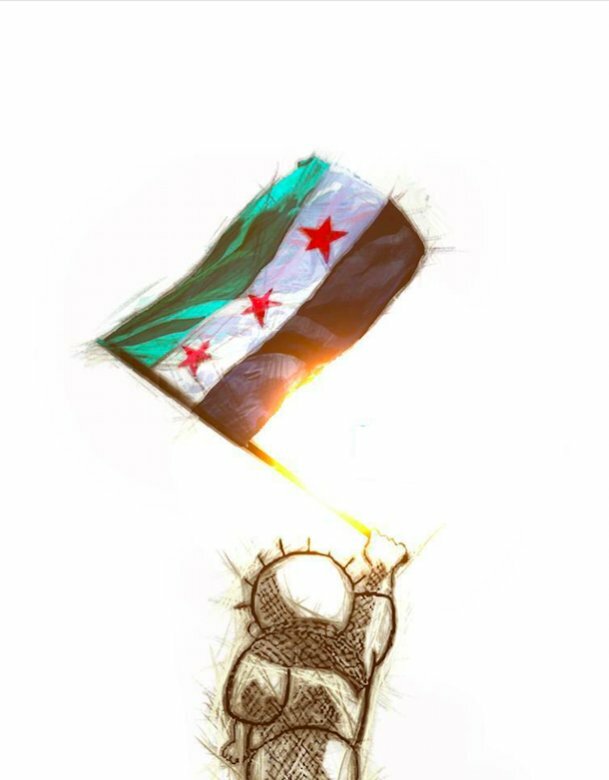 Like that gigantic fish that once lived in Egypt and was revered. 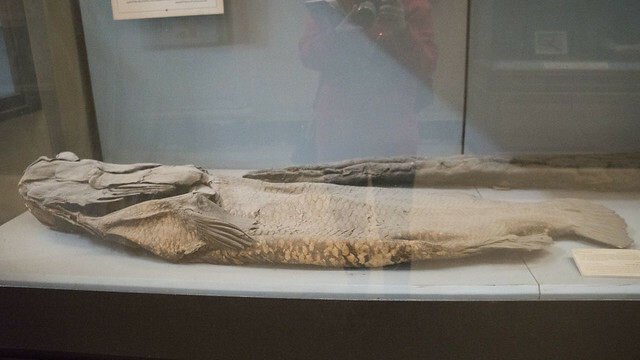 I do not think that this sacred fish was seen in the Nile in Egypt anytime soon. 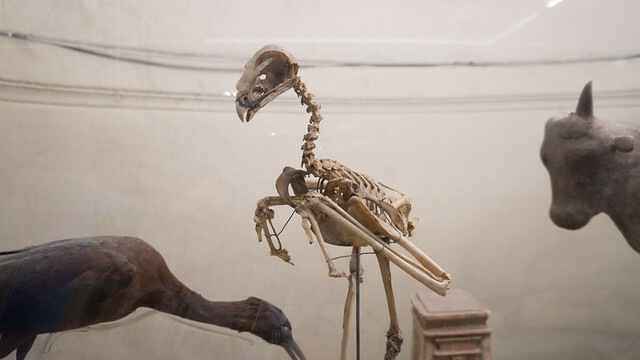 There are mummies and skeletons as well as taxidermied birds in that section. 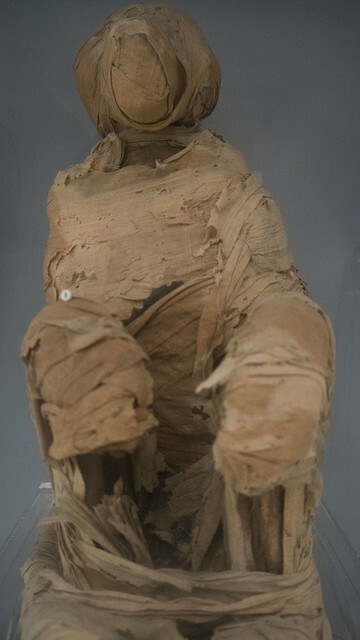 Needless to say, if the ancient Egyptians knew how to mummify living beings so perfectly, it would be hard to taxidermy animals and birds. Yes, I am the one in that reflection. 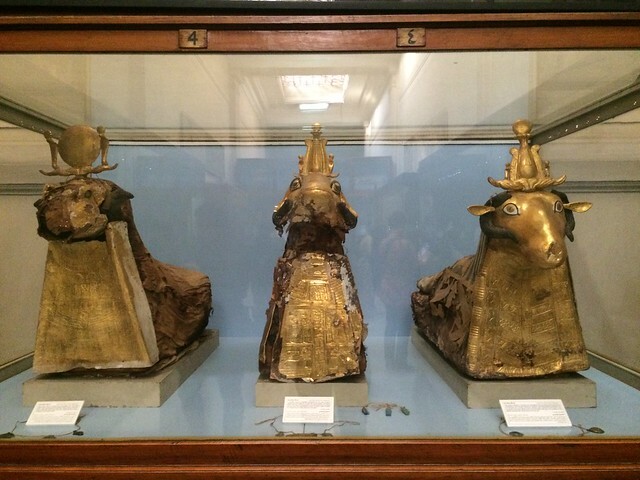 Animal golden sarcophagi at the Egyptian Museum of Cairo "December 2015"
That small section is located on the second floor of the Egyptian Museum of Cairo. I apologize for the low quality of the photos I snapped in December 2015 because I took them with my iPhone 5S then as my camera battery died during that day which was total fun as I had a very fine company accompanying me in that old beautiful museum. Our ancestors were great because they had civilization that respected every soul especially cats not just humans.I hope we become like them one day.